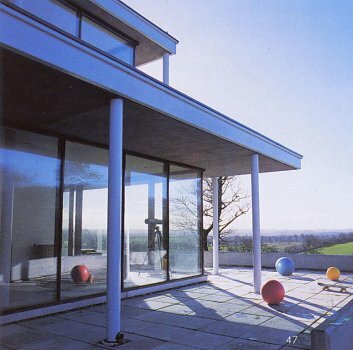 The design of Ballyedmond House is contemporary and employs a steel frame and large expanse of glass on the southern side combined with zinc panelling and concrete walls which are extended on either side to protect the house from northerly winds and obscures the views of cars from elsewhere on the site. The base is constructed of in-situ concrete. The house seeks a formal placement in the landscape in the manner of the 18th Century house and the projecting walls echo the screen walls of the grander houses.